Interestingly enough, The Australian flag was chosen through a national flag competition held by the “Evening Harold” in 1901. This was a unique event especially for its time and quickly received over 30,000 entries from men, women and children all over the country. The competition had five winners, due to similar designs, and on September 3rd, 1901, the flag had its first flight at the Royal exhibition building in Melbourne. However the flag was not officially adopted until 1954 after it received royal assent. The flag contains three main symbols; The Union Jack (or British flag) in the top left corner to represent its historical ties with Great Britain. 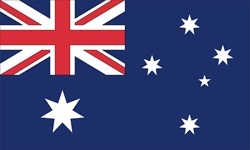 The star of the federation, has seven points one to represent all of Australia’s six states and one for its territories, in the bottom left corner. And the Southern Cross, a constellation that can be seen by all of Australia’s six states, on the can be found on the right half of the flag.